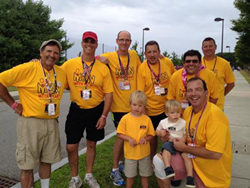 2010 was my first year walking the Komen 3 Day/60 Mile walk and I was so lucky to serve my rookie season with a great group of guys. My weekend was a truly awe-inspiring event that I will never forget. The smiles, cheers and tears will remain with me for some time. In 2016 I’ll be doing my 7th 3 Day/60 Mile Komen walk!! This year I’m going back to Philly for those 60 miles. I have also decided to do the Boston 2 day/39 mile Avon walk for the 4th time!! This will be the 4th time I’ll be doing the 100 miles for Breast Cancer. Like most people, cancer has affected my life. My wife was diagnosed with Hodgkin’s Lymphoma several years ago and is now a cancer survivor. Breast cancer has also made itself known to several in my work family. I am an avid walker and runner and have been for several years now and thought this could be my small way of doing something to make a difference. For me the walking is easy, raising the money to do the walks is a different story! That’s where you can help with your generous donation. I feel honored to be a part of the “MWH” team and ask that you give generously to this great cause. (Please see the donate link below.) Also, if there are any men out there who would like to join an organization that will truly enrich your life, look no further and join us for our next walk. I promise you’ll have the time of your life. The easiest way to contribute is to click the button below and donate via my secure PayPal link.